Portable W5 wooden wireless speaker comes with dual HIFI speakers and bluetooth 4.2 chip, which features perfect quality and powerful bass. 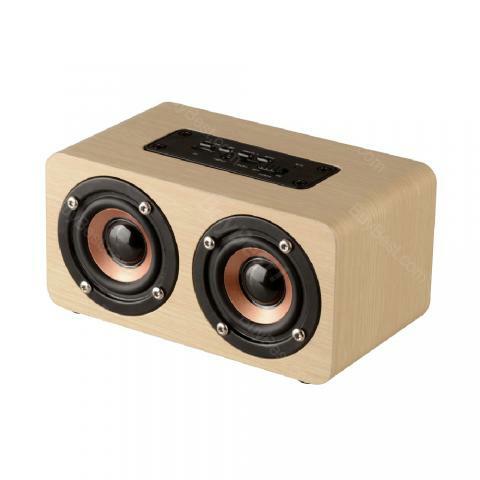 Portable W5 wooden wireless speaker comes with dual HIFI speakers and bluetooth 4.2 chip, which features perfect quality and powerful bass. You can enjoy your music wherever you are, parties, boating, camping, fishing, even hiking, and the built-in speakerphone lets you take calls out loud too. Love this little speaker! It's a 4" cube that fits right in my hand and is gorgeous! It's loud enough to comfortably fill the first floor of my 2500 SF house with music for parties or while I'm doing housework, and the base is good. There is no distortion until you turn the volume all the way up, which is too loud and not necessary for my purposes. Also, it does have independent volume control, as well as AM/FM radio, and I was able to connect easily via my Note 8. Great out-of-the-box! This Bluetooth speaker has excellent sound. Space-saving. Warm-feeling wood cabinet. Wireless (rechargeable battery), auxiliary input, and FM tuner if you need it. It calls out it its operating mode a bit loudly (E.g it says "blue tooth mode" and "power off") when you turn it on or off, but it does a great job a speaker.. Though mini, the powerful speaker is impressively loud! Sound quality is impressive even at max volume. And it's great to use it at a noise park. Worth the value. Wish it's not prone to break easily. For the price, I can't expect too much. I have been using it for three weeks, so far so good. The speaker design reminds me of old-fashioned Radio Tape Player. Chose this for decoration and functionality. I take it in weekend outing. Totally worry free when charging full, the 1500mAh built-in lithium battery can suffice two days use. It's actually very mini, love the cute design. The bass sound is enchanting. Compatible with my devices perfectly.